#TiBT 11/20/14 – Throw it Back Thursday. Throw it Back Thursday 11/20/14 #TiBT. We spotted this beauty at the Route 66 Rendezvous in 2010. Despite the rooster at the helm of this abomination, we doubt you’d pick up many chicks cruising in this car, or get much co… I mean rooster either. I can’t say it even makes me want to buy the chicken. 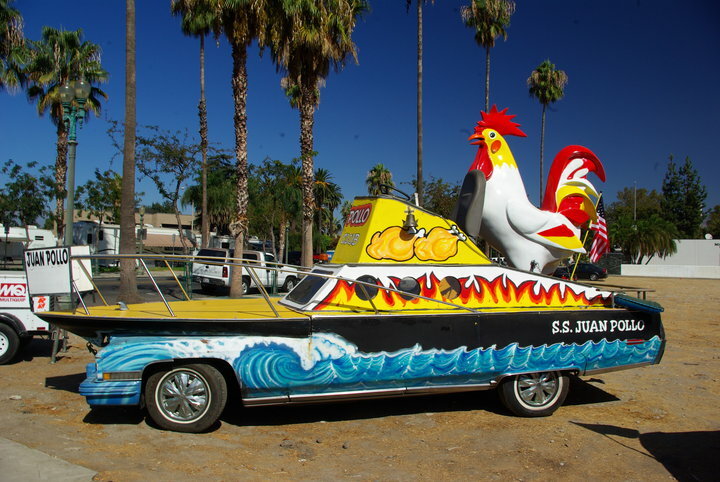 And with that boat bow protruding from the hood, cruising is what was intended, but I’m still not sure what a boat has to do with a chicken restaurant. Maybe it’s really a tuna restaurant in disguise. Chicken of the sea anyone? 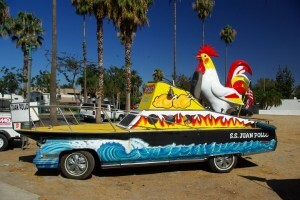 No, we don’t think you’ll get much tuna cruising in this either. What say you? Is this rolling (floating?) marketing ploy making your mouth water or turning your stomach? Vote early, vote often, and no, we don’t promise to put a chicken in every pot… or car… uh… boat… uh… thing either. This entry was posted in Miscellanea and tagged #TiBT, Route 66 Rendezvous, Throw it Back Thursday. Bookmark the permalink.